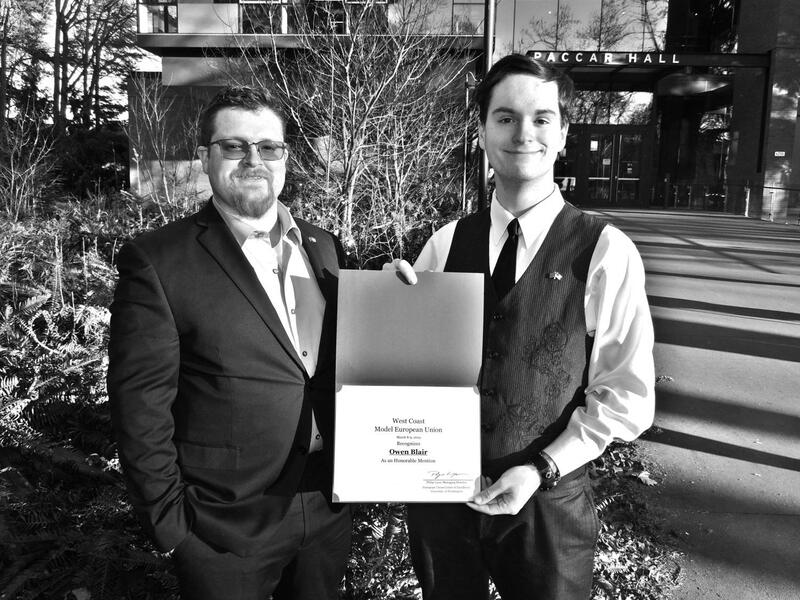 Owen Blair, one of the two students to attend this year’s West Coast Model European Union, received an Honorable Mention award for his position paper in the competition. This is the third year in a row now that a student from LCSC has received an Honorable Mention at this competition. This year, students Blair and Loren Beauchamp traveled to the University of Washington with Professor Leif Hoffmann to compete against some of the largest schools in the western US and Canada. LCSC has repeatedly been the smallest school to participate in this competition, with other participants including the University of Oregon, University of Washington, University of Utah, Brigham Young University, University of Victoria and University of British Colombia. 50 students in total competed in this year’s series of formal and informal debates. For more information about participating, contact Professor Leif Hoffman or visit www.lcsc.edu/social-sciences/programs/social-sciences-program/political-science/model-european-union/. For more information about the West Coast Model EU, go to https://jsis.washington.edu/euwesteurope/student-resources/west-coast-model-eu/.